Inside work at our new Grand Meadow location is shaping up. 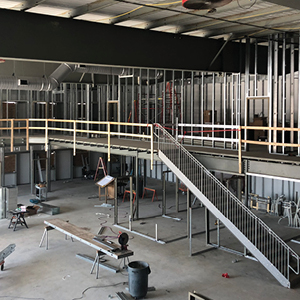 Steel framing is nearly complete and we’re working on installing interior windows and walls. The exterior is complete with the exception of building signs and finishing touches. With the impending move (est. May, 2019), we have a lot to be thankful for. In addition to a vast parts and equipment inventory, we’ll also be able to offer cold storage for customer equipment in the off season, plus additional mobile service offerings, ongoing parts delivery, and off-site parts drop locations. All of this is in an effort to provide a top-notch customer experience.